Experience the next addictive game ever created for the iPhone, iPod Touch, and iPad. ‘Peppers’ is unlike any other match-three on the market today. ‘Peppers’ took the match-three concept and raised it to the next level. 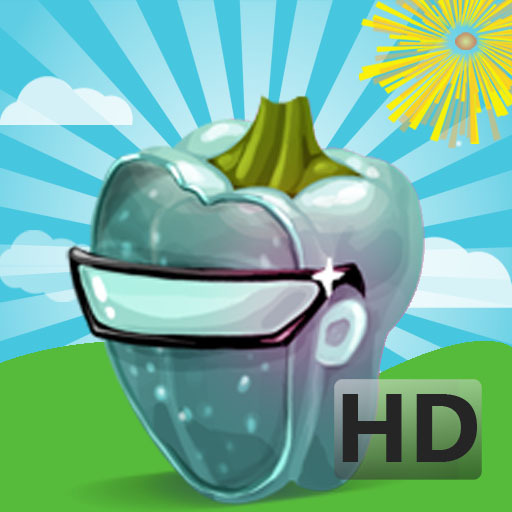 If you enjoy games like, Bejeweled 2, Tetris, Jewel Quest, Parking Lot, and Falling Gems, then you’ll love ‘Peppers’. • Four game modes and eight ways to play. • Explore 20 unique levels in the games On Fire, Hot Stuff, and Inferno. • Beautiful graphics and animation..
• Stores the top ten high scores, including game statistics. • Level select allows you to play any unlocked level. • Listen to your own music or jam with ours. In each game, it’s not just a race against time; one must score enough points in the current level to unlock the next level. The time allotted for each level will remain the same; however, as each level gets harder the points necessary to unlock the next level will be reduced. The game will end if the timer runs out and the next level has not been unlocked. Touching the Next Level progress bar will display the ‘Game Info’ screen indicating exactly how much time is left, and the number of points necessary to unlock the next level. Looking for game hints? There are none! Each game will begin with three pepper shakers which are displayed at the top of the screen. As progress is made through the twenty unique levels the game will get more challenging. If unable to find the next move simply shake the device to randomly rearrange the peppers and hope for the best. Since there are only three pepper shakers per game use them wisely because chances are they will be needed later on. If no mores are possible one of three things will happen. If the next level was unlocked then it will begin. If not and there are still pepper shakers available then one will be used to continue, otherwise the game will end. Unlike traditional match-three games in which only two game pieces swap places, in ‘Peppers’ entire rows and columns are moved to match three or more peppers. Once three or more matching peppers are lined up they, along with any adjacent peppers, will begin to shake. In every other level there will be a ‘locked’ pepper. A row with a locked pepper cannot be moved up or down, likewise, a column with a locked pepper cannot be moved left or right. Score extra points by removing locked peppers. Once satisfied, press the ‘Fire’ button. Much like ‘On Fire’ entire rows and columns are moved to match three or more peppers. Once three or more matching peppers are lined up they, along with any adjacent peppers will immediately be removed from the game board. Inferno is our latest twist on the classic match-three gaming experience. In 'Inferno', you will choose which column to launch the pepper on deck into. Any peppers matchin this pepper will be removed from the game board. Locked peppers can only be removed after matching three or more peppers after the pepper has been launched. 'Inferno' requires a little more strategizing if your goal is to maximize your score. The best advice we can give is to carefully study the game board, and strategically lauch each pepper into a column that will in turn cause other peppers to line up. In this game rows and columns are not moved. To play, simply touch two or more matching peppers to make them shake. Once shaking, either touch them once more to remove them or touch two or more different matching peppers. Look at begining and ending of each column, many times three or more matches could be found simply by moving the column left or right. The same goes for each row, if there are two matching pepper at the bottom of the row and one at the top, just move that row. Strategically move rows and columns around to group as many peppers as possible to score really big points. 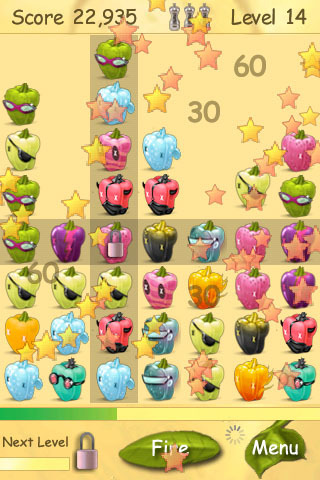 A row or column with a locked pepper cannot be moved, however, you can score some extra points by removing peppers from the game board.